Since getting back from the Level ll Cert, in St. Paul, a couple of weeks ago I decided to give my training some structure, inspired by the new Max V02 'boost' protocol...but first a small break. Because I had been swinging with mostly the 16kg, and up, for weeks, I was having some upper back soreness that I kept irritating by these heavy workloads. 2-hand swings? No, that doesn't count because you did only 600 reps. 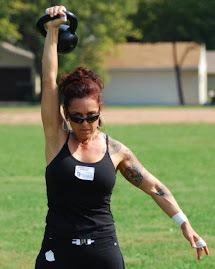 It's as if you didn't even look at the kettlebell. I was 'pacing' a client because I forgot my gymboss and she and her husband workout together and pace eachother, but he wasn't there. I didn't really count it because even though it was only the 12kg (2 handed) I was so wiped out from my workouts over the weekend and then a heavy workout on Monday, I could barely swing it, lol!